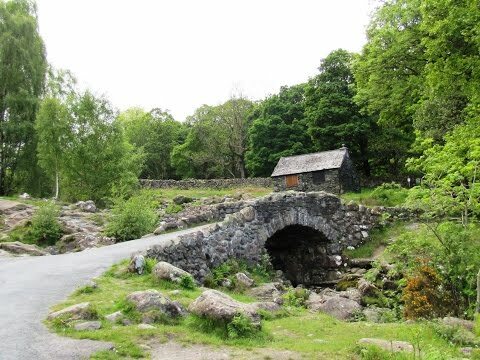 Ashness Bridge, situated on the Watendlath road, is maybe one of the most photographed stone built pack horse bridges in the Lake District due to its location and the stunning views looking north to Derwent Water, Whinlatter and Skiddaw. Further up the road at “Surprise View” the views are even more stunning. From here you can see Borrowdale to the south, the whole of Derwent Water, and on a clear day Bassenthwaite lake to the north of Derwent Water. High Seat, at 608 metres (1,994.75 feet), located in the centre of the Lake District is the highest point for about 5 miles in any direction therefore making the centre of the Lakes lower than the surrounding parts. It sits on a ridge with Bleaberry Fell to the north and High Tove to the south. A fence runs along the ridge, a useful guide in mist and also for getting round the boggy parts. The summit is set on a small rock platform with an OS column. The views are amazing the whole of the Helvellyn range can be seen to the east and on the other side of the ridge the panorama of high fells from Crinkle Crags in the south to Blencathra in the north. Bleaberry Fell at 590 metres (1,936 feet) is the northern most top on the ridge that separates the valleys containing Derwent Water and Thirlmere. Although this ridge is known for being boggy underfoot Bleaberry Fell is mostly dry. The heather covered summit has a number of cairns and provides wonderful panoramic views. Its subsidiary top is Walla Crag. Derwent Water, one of the prettiest lakes in the Lake District, is about 3 miles long by 1 mile wide and sits on the south edge of Keswick town and is fed and drained by the River Derwent. The river also connects Derwent Water to Bassenthwaite Lake which is north of Keswick. There are several islands in Derwent Water the largest being Derwent Island on which stands the inhabited 18th century Derwent Island House. The house is a tenanted National Trust property open to the public on five days each year. Lords Island was also home to a grand looking house and a drawbridge but in the late 18th century the house fell into disrepair and only the foundations remain now. The stone from the house was used to build Moot Hall in 1813. Keswick is a wonderful market town. Moot Hall in the centre of Keswick was once the town hall but is now a tourist information centre and it is here in the square where the market is held every Saturday. During the 16th century Keswick was home to copper and lead mining on a small scale and the town was also the source of the world’s first graphite pencils. The pencil industry continued in the town until 2008 when it then moved to Workington. The Cumberland Pencil Museum and the Mining Museum are both close to the centre and are excellent places to visit on rainy days. Keswick is now mainly tourist orientated due to the many thousands of tourists visiting every year and the majority of side streets are abundant with B&B’s. This walk can also be done from the nearby Ashness Ferry Landing. We turn left out of the car park following the Watendlath road to Ashness Bridge. We cross the bridge and turn immediate left and head slightly uphill with Barrow Beck on our left. We pass through a gap in the fence then head uphill following the wall on our right. We cross over a stile and follow the fence on our right still uphill to the top of the field. We go through the gate then follow the path going slightly left. When we reach the beck we turn right up the steep steps to the top of Dodd. We then bear left and keep follow the distinctive path and then track which winds its way up to the top of High Seat. At the summit we turn left at the trig point and head downhill to go through the fence. We keep heading forwards making our way round the boggy parts. We start to go uphill heading to the cairn you will see in the distance on the top of Bleaberry Fell. After passing the cairn we pass a couple of stone shelters before heading steeply downhill to pick up the distinctive path down below. We pass a sheep fold on our left and keep following the path over a little beck. When we reach a cairn we turn left and follow the path until its splits. We bear right and head downhill towards Ashness Bridge and a gate we can see ahead. We go through the gate and make our way to the road. We turn right and follow the road back to the car park. This is a moderate to hard walk on grass and stony paths and tracks with a short section of quiet tarmac road. There are some steep inclines and declines and also some boggy sections between High Seat and Bleaberry Fell. Elevation: Approx lowest point 90.9m (298ft) approx highest point 603.6m (1980.3ft) ascent 571.10m (1873.7ft). Approx 5.2 miles allow 3 hours using OS Explorer Map OL4, The English Lakes, North-western area, Keswick, Cockermouth & Wigton. Start point: small free car park just on the left as we turn onto the Watendlath road from Keswick. The Borrowdale Valley is in the Lake District, Cumbria. From the A66 coming from the east take the A5271 for Keswick. At the junction turn right. At the traffic lights carry on forward. At the mini roundabout turn left then bear left again at the junction. At the roundabout go straight over then at the next roundabout turn right and follow the road B5289 for approx 2 miles then turn left at the sign post for Watendlath. The car park is just on the left. Parking: There is another small car park at Ashness Bridge. There are no public toilets or refreshments. The nearest facilities are at Keswick where there are public toilets and ample shops, bakeries, cafes, take-away and pubs to choose from.